For years I’ve had several vacuum tubes that I scavenged from my Grandfather’s basement. However, they were pretty unsteady when trying to stand them up in a display case. The stands themselves are pretty simple, just a wide base tall enough that the pins on the bottom of the tubes can be recessed. An additional inset is to help the bottom of the tube also to be recessed rather than to sit flush on top of the stand. This helps to make the stand less noticable when the tubes are mounted. This is on of the more basic models that I created and aside from using a lot of plastic, I expected these to be easy to build. I’m pretty much wrong whenever I expect something to be easy. 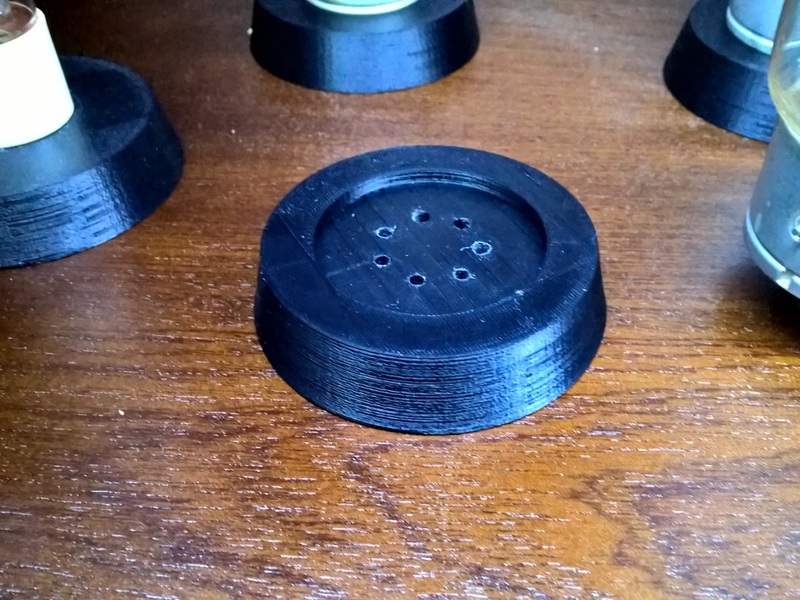 The base of these turned out to be quite difficult, when printing a large flat bottom, the cooling plastic during the print tends to shrink and lift off the printers base. Despite appearing to be the most stable base ever, the shrinking plastic popped the model of the printer be and deformed the different adhesive materials I tried. In the end, the solution was to upgrade to a heated bed for the Printrbot. I’ll never go without a heated bed from now on!